My family arrives in Rochester, New York, home of Xerox (where my father worked for 25 years), Kodak, Genessee Beer, the Rochester Institute of Technology, the University of Rochester, and Bausch & Lomb. The Vacuum Oil Company, a predecessor of Mobil Oil Company, was founded here in 1866. We first move into a house on Saunder Street within the city. I attend the kindergarden nearby for one year. Family moves to 36 Horizon Drive in Penfield, a suburb east of Rochester. In 1970, the town's population is somewhere between 20,000 and 25,000. Rochester is a city of approximately 962,000. Part of Rochester's fame is that it receives less sunshine than almost any city in the U.S. The city of Rochester is known as the "Photo Capital of the world" and the "city where the Seaway meets the Thruway." The city is on Lake Ontario at the Genessee River and Irondequoit Bay. It is a part of the New York state Barge Canal. The city was incorporated in 1834. It was the center of the Abolitionist activity in the years before the Civil War. The city was energized by the opening of the Erie Canal in 1825. The University of Rochester (established in 1851) and the Rochester Institute of Technology (established in 1829) are located here. George Eastman made his first camera here in 1888 and then built the Kodak empire in the city. The prestigious Eastman School of Music, under the direction of the famous American composer Howard Hanson, has become known for new and challenging symphonic works. The city has one of the world's largest lilac collections. I play roles in several school plays. My favorite role is as the "M & M" Man, who comes running on stage to tell the poker players "Hold it boys! The Dirty Dealer meant no harm!" Parks I attend in the area at this time include Mendon Ponds (a favorite swimming spot for the family), Ellison Park, and Webster Park. We play a huge number of football and baseball games in my backyard with the neighborhood kids. In 1971, at age 11, I play Pop Warner football for the Penfield Lions (Lou Trabolzi was our coach), weighing a measly 70 pounds. I shovel a lot of snow off our 36 Horizon Drive driveway as a result of the many blizzards during those years. But our school superintendent is a tough character. Our school is usually the only one in the greater Rochester area that would stay open after a big storm. During this period, I attend Bay Trail Middle School. My teachers include Mrs. Kapoor, Miss Iaia, Mrs. Hartman, Mr. Lynch, Mr. Sherwood, Mr. Wensel, Mr. Erwin, Mr. Welkley, Mr. Larry Bennet, Mrs. Miller, Mr. Magde, and Mr. Winfield. My friends and I build a fort out of tree branches near the Magde farm (which is now a subdivision). We began playing golf, frequenting the Durand-Eastman course, and the two Genesee courses. In addition, our neighborhood in Penfield becomes an impressively athletic incubator. We run road races with colored chalk and crayon lane lines on our street (Horizon Drive) to simulate the Summer Olympics (it was handy that our block is one mile in length, making mile races convenient to hold). We also play what seemed like hundreds of soccer games in the backyard of the Bellavia's. Many of the girls and boys in the neighborhood become star athletes in school as a consequence of the rigorous training experienced in the neighborhood. I also play on the varsity Penfield football team (flanker, defensive back). The most memorable high school football game I play is against the Fairport Red Raiders, who are New York's #2 ranked high school football team at the time. I'm proud to say that despite our team losing, I am able to catch 3 passes for 110 yards that day. One was a 60-yard catch for a touchdown during our famous mis-direction play, which was whimsically called the "waggle pass." (It was an amusing sight when our coach "waggled" his hips to signal that play to our quarterback from the sideline.) The play was fearsome to opposing teams, as no team was able to stop the waggle pass that year. 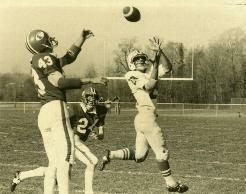 Indeed, a defensive lineman who played in that game for Fairport contacted me 30 years later to let me know that Fairport was well aware our waggle pass, and in the days leading up to the game tried to prepare themselves to stop it (and me). But despite their expecting the play, they were, like many of our other opponents that season, unable to stop it (or me). The photo above shows me catching a 30-yard pass earlier in the game. One interesting aspect of the game: it is believed that the game set a national high school record, because the 10 extra points kicked in the game were the most ever kicked in a high school game that were all successful kicks. I swim in Lake Ontario, Seneca Lake, Canandaigua Lake, Keuka Lake, and Conesus Lake (all except Ontario are part of the "finger lakes"). I work as a valet at Oak Hill Country Club, which allows me to occasionally play their superb course. 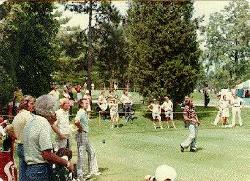 The PGA Champisonship was played there in 1980, and I am able to watch, in-person, Jack Nicklaus, Arnold Palmer, Hubert Green, Dave Stockton, Lee Trevino, Hale Irwin, Ben Crenshaw, David Graham, Don January, Tom Watson, and Tom Weiskopf (see photo of Jack Nicklaus, David Graham, and others at the Rochester PGA Championship). 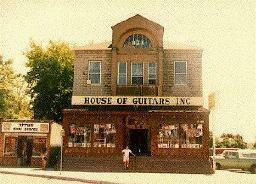 My favorite record store was the world famous "Great, Great, Great House of Guitars" (which "loves you, baby!"). The shop (see photo below) was most infamous for it's depraved television advertisements, in which the owner is often brandishing a knife and who's band is called "Armand Schaubroeck Steals" due, apparently, to his prior conviction for theft. The inner walls are filled with signatures from famous (mostly rock) muscians who have visited the store (the store has an excellent collection of musical instruments), including Ozzy Osbourne, Motley Crue, Aerosmith, Jon Bon Jovi, The Ramones, and Metallica. Founded in 1803, the city is a high-tech industrial and cultural center. It is the third largest city in the state. Famous historical citizens include Susan B. Anthony, Frederick Douglas, George Eastman, Hiram Sibley, and muscians Mitch Miller, Cab Calloway, and Chuck Mangione. The city is on the Genessee River where the river empties into Lake Ontario. The city and its suburbs are rich in the production of orchard fruits (especially apples).